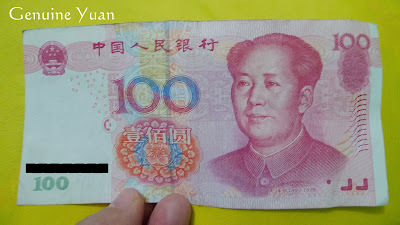 Before flying to China I heard that there are a lot of fake RMB 100 notes circulating in China. So I exchange my money only with the Bank of China to avoid getting counterfeit yuan notes. Take the bill and ruffle it in your hands.The long way up, in your hands and kind of ruffle it in your hands. The sound should be clear and distinct. In the fake ones, the sound is muffled and the paper seems crisp. There are two things to see in the light. 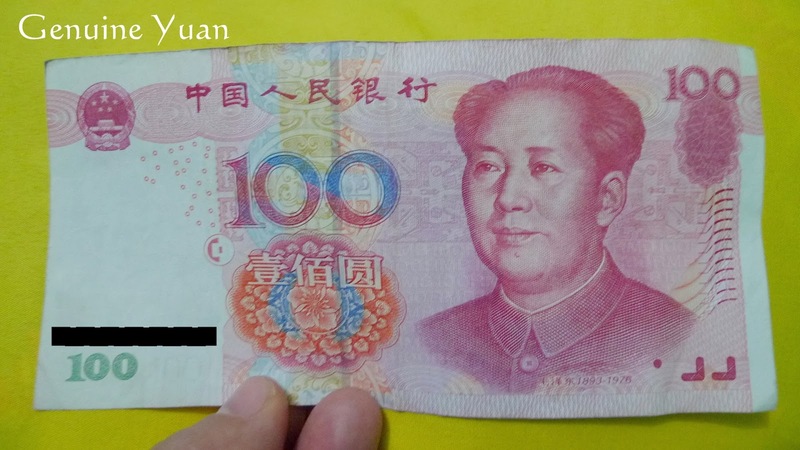 If you hold the bill up you will see on the left side in the white space, there is a clear picture of Chairman Mao's face. On the fake bills, the outline of his face is blurred. Below the white space, there is a green 100 (or 50 on the 50 bill, 20 on the 20 bill etc.) sign in the left corner. When looking flat at this sign, it is green. When the bill is tilted upwards, and you are looking at the sign from the bottom up the 100 turns brown. This is a real bill. But if when you tilt the bill upwards the symbol is only dark green, then this is a fake bill. Hold the bill in your hand and rub your thumb gently against the collar on the big picture of Chairman Mao. You will notice a difference in texture on his collar. You will only feel it if you rub gently. If the paper is completely smooth, without any texture, you are holding a counterfeit!